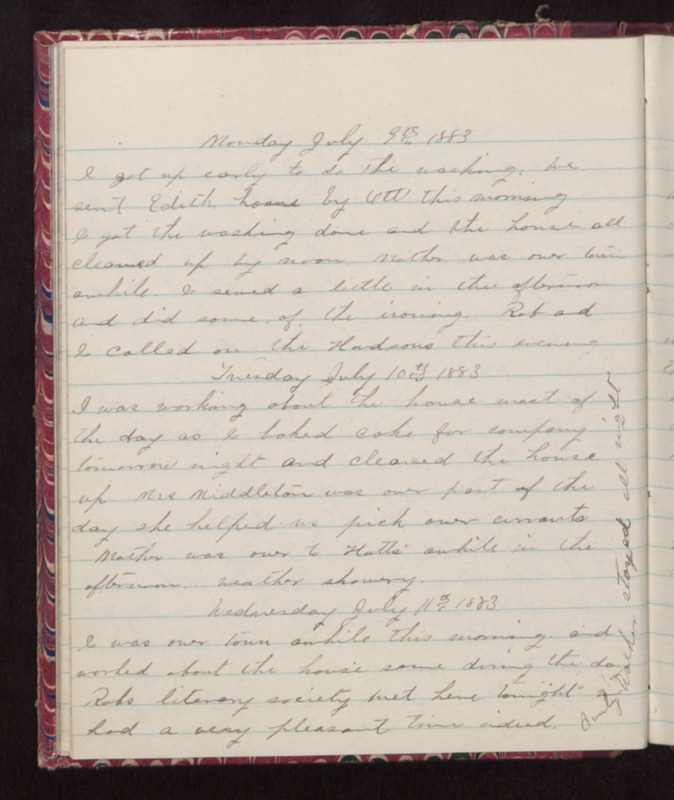 Monday July 9th 1883 I got up early to do the washing. We sent Edith home by Ott this morning I got the washing done and the house all cleaned up by noon. Mother was over town awhile. I sewed a little in the afternoon and did some of the ironing. Rob and I called in the Handsons this evening Tuesday July 10th 1883 I was working about the house most of the day as I baked cake for company tomorrow night and cleaned the house up Mrs Middleton was over part of the day she helped us pick our currants Mother was over to Hatts' awhile in the afternoon. Weather showery. Wednesday July 11th 1883 I was over town awhile this morning and worked about the house some during the day Robs literary society met here tonight we had a very pleasant time indeed. Aunty Walker stayed all night.